I read and enjoyed Joe Hill’s first novel, Heart-Shaped Box. The plot was interesting, characters compelling, and he has a lyrical twist to his prose that is very satisfying to read. That’s why I was so disappointed to put down his latest, Horns. Iggy Perrish awakens, the morning after a drunken and debauched long night, to find he is sprouting horns. Pointy, fleshy, devil-ish horns with angry red tips. And while people seem to be able to see them, they also act, once they’ve turned away, as if they have forgotten them. It turns out that Iggy is widely believed to have raped and murdered his high school girlfriend, Merrin. And although he’s tried to put it behind him – after all, he is innocent – her loss and the terrible aftermath have scarred his life. As he navigates his new, horn-filled landscape, Iggy reconnects with friends and family, only to find that in his new, horn-ridden state, they are compelled to speak honestly to him. And what they have to say is terrible. His loving grandma is revealed as an unpleasant witch who has spent the last 20 years manipulating her daughter (Iggy’s mother) into waiting on her. His mother and father both believe him guilty, and irony upon ironies, it seems that his dad arranged for the fire in the crime lab that burned up the evidence that would have proven Iggy’s innocence – but of course, Dad saw himself as rescuing Iggy from certain conviction. And most devastatingly, his brother blurts out that he has known all along who really killed Merrin and has kept it a secret all these years. This takes us through Chapter 10. Where to go from here? He loops back right to the start of the story – the day the youthful Ignatius Martin Perrish first spies the lovely red-haired Merrin. And I get it, right away. Hill intends to lead me through the past, revealing the plot, the teens’ building relationship, the loving parents, the doting grandma, the rough-but-well-meaning friends, but he’s already shown me the squirmy compost beneath the blooming flowers. And as there are 50 chapters all together, that means I have to read 40 chapters to tie up all the plot lines that are sure to emerge. So I cheated a bit. I went to the last few chapters to see if the book is going where I think it will go, willing to be convinced to head back to page 59. But sure enough, there’s the brotherly heart-to-heart followed by the chilling and other-worldly revenge. And I’m just not in the mood – it’s too dispiriting. Back to the library with you, Horns. 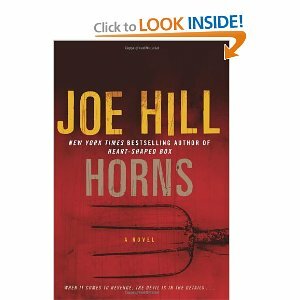 This entry was posted in Commentary, Review and tagged Heart-Shaped Box, Horns, Joe Hill. Bookmark the permalink.